Anyone who plays 1 e4 as White must be prepared not only for Black's main defences but also an assortment of less popular lines. These, when taken together, represent a significant percentage of the replies you can expect to meet when opening 1 e4. Dealing with these slightly offbeat variations is often a daunting task, especially since your opponents are likely to be specialists in these lines and therefore know them inside out. This book provides the perfect solution. International Master Andrew Greet gets to grips with each of these tricky openings. He identifies how to exploit their weaknesses whilst avoiding their strengths, thus constructing a practical and dependable repertoire for White. 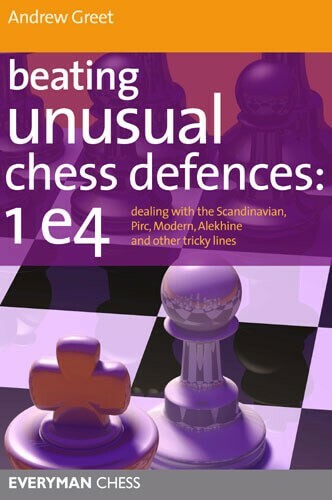 This book covers everything a 1 e4 player needs to know about facing these defences.  Ideal for improvers, club players and tournament players. Andrew Greet is a young International Master, a former British Junior Champion, and is one of the UKs most rapidly improving players. In 2005 he scored a perfect 11/11 in the British National League, the first time any player had achieved this remarkable feat. He is also an experienced coach and writes regular articles for CHESS.